If this is your first time setting things in motion for homeschooling through high school, you’ve come to the right place for your high school and higher education needs! Over the past decade, an explosion of “homeschool help” has blown up the internet. It’s tough to clear through the multitude of offerings for homeschoolers – truly mind blowing. We are right there with you and realize that while many of those resources cost a good bit of money, there are some that are perfectly free and great for helping you chart your path with clarity. 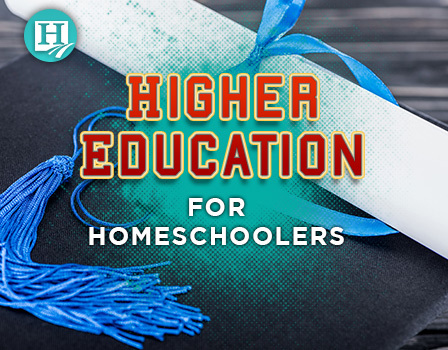 In a culture of diversity of education, training, and career paths – higher education for homeschoolers can come in many different forms and Homeschool.com is here to help you find your perfect fit. Students may be interested in the traditional college or university path, however, there are many other forms of higher education that students may find more suitable to fit their needs. Many high school students have no desire to attend a college or university. In addition, formal education may not even be necessary for the career path they have chosen. However, it is typical to find that some type of “credential” that vocational or technical jobs require to be added to an employee’s resume. This can come in the form of internships, apprenticeships, hands-on experience, or even vocational or technical school. Find other alternatives at our Virtual Conference and other events! Does My Homeschooler Need a High School Diploma?